SCP-1087 in Site 38 arboretum, photographed remotely. Special Containment Procedures: SCP-1087 is to be kept in the Site 38 arboretum, which is to be stocked with multiple species of insects and small birds to meet SCP-1087's dietary needs. Personnel are not to enter Arboretum 38 without a Foundation Type 2 breathing apparatus except during testing. Testing of SCP-1087's effects may be performed on D-class personnel; however, to avoid interfering with research into other SCPs, testing should take place between 2200 and 0600 hours. D-class affected by SCP-1087 are to be terminated before Foundation personnel cause injury to themselves attempting to reach them. 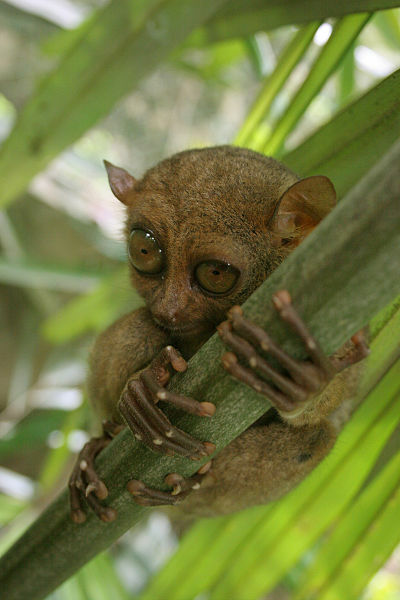 Description: SCP-1087 is a white male Phillippine tarsier (Tarsius syrichta), age estimated at 5 years, 700g in weight. SCP-1087's saliva contains an unknown chemical not naturally produced in the primate body. The chemical is inert by itself; however, once it makes contact with a mammalian bloodstream, it travels to the subject's exocrine glands and alters their biochemical functions. This results in affected subjects producing and secreting a pheromone designated as SCP-1087-1. SCP-1087-1 will be secreted from all exocrine glands simultaneously, emerging in the subject's blood, saliva, sweat, and waste fluids. Affected subjects will produce this pheromone at high concentrations (up to ██ mg/L), leading to eventual exhaustion and dehydration. Mammals coming into contact with SCP-1087-1 become increasingly agitated, specifically towards the being emitting the pheromone. As time passes, the concentration of pheromones will severely hamper the judgment of nearby animals, including humans, compelling all mammals near the affected subject to hunt and attack the organism emitting SCP-1087-1. High concentrations of SCP-1087-1 will develop in affected subjects' blood; when assaults against affected subjects become severe enough to draw blood, more animals will be drawn to the area and join in the attack. Experimentation suggests that it is effectively impossible to rescue an affected subject without a breathing apparatus meeting Foundation standards of at least Type 2 or higher; without this, any rescuer will be overcome by SCP-1087-1 and will begin attacking the subject as well. Once the subject is dead, all attackers will leave the area without feeding on the affected subject; this suggests that the flesh of affected animals seems poisonous to those under the influence of SCP-1087-1. It should be pointed out that SCP-1087 is immune to these effects; SCP-1087-1 has no effect on its biochemistry, and it seems to feed naturally by eating the meat that other predators find poisonous. SCP-1087 has shown a wariness around humans, but is willing to attack humans if it feels it can do so with relatively little risk; the tarsier's naturally nocturnal habits favor it in this regard. Recovery Log 1087-1: SCP-1087 was discovered following a trail of unusual livestock deaths, including one in which a cow was trampled to death by the other cows in the area and then preyed upon by an unknown small carnivore (but no other animals). Examination of the surrounding areas led Foundation personnel to a barn several miles away. The barn was not in use, its owners having been sentenced to prison after killing their eight-year-old son. A mobile task force secured SCP-1087 through the use of anesthetizing gas and brought it to Site 38 for containment. Another investigation suggested that a series of unusual murders throughout the Southeastern United States might have had a connection to SCP-1087, due to what was believed to be small primate bites on each of the victims; however, conclusive evidence was never recovered to support this hypothesis.